After 27 years in the advertising business, I have been exposed to all kinds of propaganda, and I’m sure I have been guilty of propagating some myself. But, I have always tried to base mine on logic. So when I hear the social media people tell me that television is fast becoming a thing of the past, I must question the logic in which they base this claim. Are they unaware that in 2009 the average American home had 2.86 TV sets; 18% higher than 2000 and 40% higher than in 1990? Or that Americans spent over 36 hours a week watching TV last year compared to 4-hours a week using the Internet? Perhaps they also forgot that 35% of all advertising dollars will be directed to TV advertising in 2010. Even if they were aware of these facts, I’m sure it remains a mystery to them “why” television remains so popular. So, let me clear up this mystery as succinctly as possible. Consumers continue to purchase TV sets, at a record pace, because they simply enjoy watching what’s on them. It’s passive entertainment. It requires them to do absolutely nothing, but switch it on. A comforting concept in today’s overly active world. 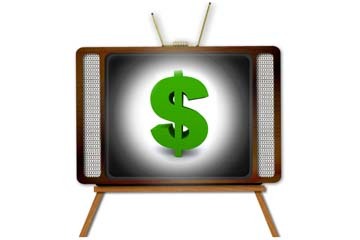 TV receives 35 cents of every ad dollar spent because it works for its advertisers. Despite the debate over Push vs. Pull marketing; there’s apparently more than enough consumers who are still happy to be “pushed” into stores all across America. While building online communities, cultivating dialog and adding twitter followers may eventually pay dividends. TV pays those dividends NOW. This entry was posted on Tuesday, April 20th, 2010 at 3:52 pm and is filed under Interactive, ROI, Trends, TV advertising. You can follow any responses to this entry through the RSS 2.0 feed. You can leave a response, or trackback from your own site.